Canikur® Pro Paste for Dogs contains three ingredients including both probiotics and prebiotics, that work together to support your dog's gut function. 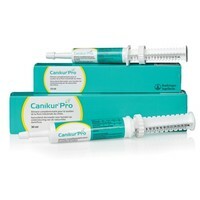 Canikur® Pro can be given alongside any prescription medicines that your vet may recommend. Most dogs love the tasty meat flavour and will eat the paste straight from the syringe. It is recommended that Canikur Paste is administered twice daily. I used this on my cat on the advice of a vet when he had diarrhoea, even though it's for dogs. I used the amount advised for small dogs and it worked brilliantly. It stopped the problem plus, and this is a big plus, I didn't have to chase him around the room to give it to him, he licked it from my hand like it was his food, he loved it. I now buy this online and use it whenever the diarrhoea returns. When I asked to buy this from the vet who first gave it to me they lied and said it is licensed and is for dogs. They gave me another brand which was in the best interest of the vet not my cat and trying to administer it to him was a nightmare as it smelt like mothballs and of course my cat was having none of it. I rang the manufacturer of Canikurpro to ask if they could make one for cats and they told me it is not licensed as it is not a drug, merely a probiotic. My cat loves it and therefore so do I. My Staffie cross/lab has a delicate stomach and this works wonders, she just licks it off the end of the tube, whenever she sees the tube she gets excited no problems in administering and would recommend for any dogs with a delicate stomach. We have a cat that often gets an upset tummy and vet prescribed a tube of this.It worked and now we keep a tube in all the time.Had no issues giving it to our cat but then she did like the stuff. Works for cats too! Don't expect kitty to lick it though, and don't faff about with trying to aim with the syringe into the mouth of a wriggling cat. I squeeze it onto my finger and more or less wipe it into her mouth. She hates the taste and consistency (wouldn't you? ), but it really does help with diarrhoea. This product works to relieve my elderly Border Collies pancreatitis associated diarrhoea within 4 days. It's easy to administer squeezed onto food as she loves the taste. Vet UK's price is also significantly less than from my vets. I always keep a tube in stock. This product is very easy to administer especially to young puppies. It is also effective against diarrhoea, as long as it is used twice a day for at least 4 doses to ensure it all clears up. I have found that if you stop using it too soon, the condition can return. My setter has had puppies and the vet suggested this, it was brilliant-it sorted her out in no time. She had eaten too many afterbirths!! !I will continue to keep it in case I need it. Our cocker spaniel has a sensitive stomach and when he gets diarrhoea this product settles his stomach very quickly and gently (usually within 12 hours). It's really easy to administer as he loves the taste. Our vet recommended it and it's great.